Every year, the municipality of Santorini offers the Santorini volcano virtual eruption, a spectacular show for all the island’s cliff side to see which takes place once a year as an honor to all the guests and travelers that visit the beautiful island of Santorini. Santorini volcano virtual eruption expected to create a spectacular sight is programmed by the island’s Municipality Geothira Company for September. 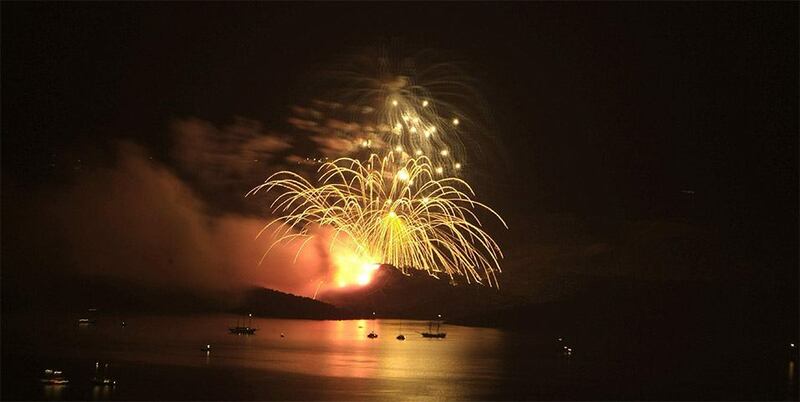 The show is unique, fireworks and flares over the volcano are being lit to recreate a virtual explosion. Santorini is the site of one of the largest volcanic eruptions in recorded history and is thought responsible for the collapse of the Minoan civilisation on Crete which was hit by a tsunami that came in its wake. If you want the flexibility for spontaneous adventures or if you have a plan to visit Santorini for the virtual eruption of Santorini’s volcano, a car rental from Santorini Holiday Cars is an ideal solution. Except from the millions of visitors who enjoy their holidays each year in Santorini , there is a lot of people who come only to watch this fabulous show that can causes to them a lot of emotions and travel them to a word of pictures, colors, and sounds that please the senses. It is an unforgettable experience, full of surprises , that causes awe every single time someone watch it.